A rather industrious reporter for the Ottawa Citizen may have found some new third jersey logos. In his blog Hockey Capital, James Gordon writes, "Potential new logos and third jersey centrepieces are starting to trickle out of public document filings in the lead-up to the 2008/2009 NHL season and I've posted a few here for your perusal." The new image we haven't seen before is this one, which appears to be the Los Angeles Kings logo described by Howard Berger last month. He said, "The Kings will unveil a predominantly black jersey with the letters 'LA' inside a pencil-point logo on the front." If he's right, this appears to be our winner. 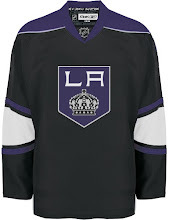 This concept jersey I posted a few days later is the closest yet. It doesn't end there. A logo he found for the Coyotes all but confirms the logos I posted here and here. Though this is the black and white version. I really love that logo, by the way. And for whatever it's worth, Gordon also had this logo for the Edmonton Oilers' 30th anniversary celebration. My unending appreciation goes to Greg at Puck Daddy for the tip as well as continuing to pimp Icethetics!